There’s no shortage of comics addressing the state of the world, either confronting the political climate directly or with a bit more subtlety. 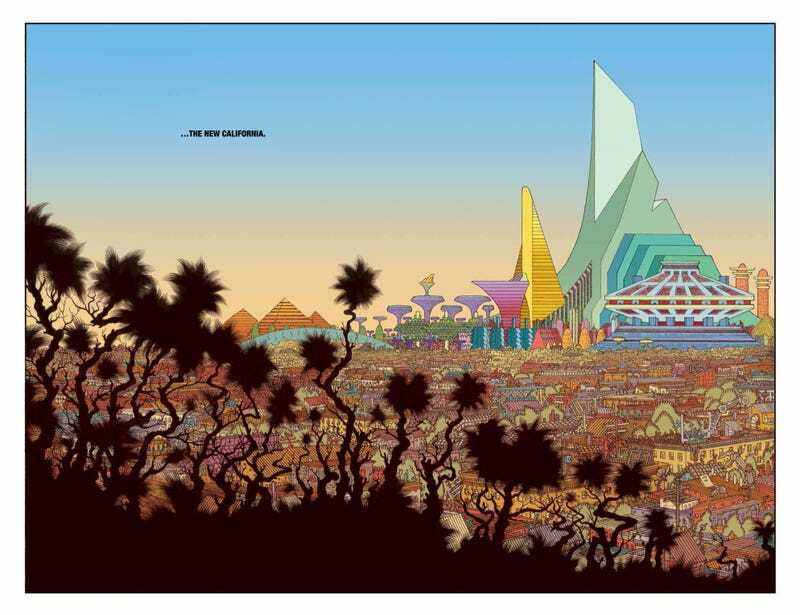 The New World #1 (Image) is only one such vision, set in a middle future just a couple decades out that echoes the present. After nuclear blasts wiped out significant parts of America, other nations rose out of what was left. The New World concentrates particularly on The New Los Angeles, which appears to act as the capital of The New California. There are state-sponsored enforcers called Guardians that act not only as law enforcement but also entertainment, broadcast all over the world in an internet age version of Rome’s gladiatorial contests. It’s Hunger Games meets Demolition Man with a healthy dose of The Private Eye. It’s hard to imagine an artist other than Tradd Moore taking on the challenges of The New World. 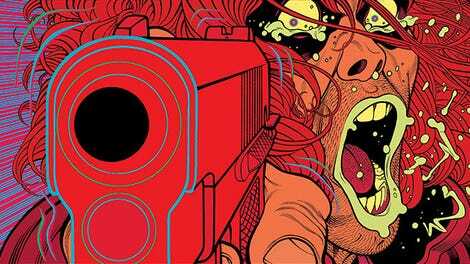 Moore is probably best known for his work with Justin Jordan on the Luther Strode series, where his skill with character design, facial expressions, and gory fight scenes played an important role. The New World affords him an opportunity to feature the first two talents again, but with a new emphasis on world building and imaginative, in-depth backgrounds and settings to boot. It feels a little strange to see a very wide shot instead of coming in close enough to appreciate how Moore draws hair and clothing in particular, but his imagining of a future Los Angeles that’s even more internet connected and fueled by drugs and politics than right now is fascinating. Thanks in no small part to colors by Heather Moore, it’s beautiful in smooth dayglow and vibrant jewel tones that fill in the spaces between Moore’s crisp linework. When it comes to highlighting the technology featured and the distance it crosses, letterer Clayton Cowles adds subtle but important details that draw the eye and establish both the similarities and differences between The New World and ours. The book is a joy to look at in every way. Writer Aleš Kot is no stranger to making unapologetic statements with his work. Generation Gone confronted the comfortable myths that people like to tell themselves about millennials while imagining what they would do with superpowers that could help them pay off student loans and make medical debt disappear; Material told stories of how systems intersect to oppress people under the framework of colonialism and police brutality; Days Of Hate, another ongoing Image title, is set in an even closer future overshadowed by an even more repressive and regressive American regime. Kot has a clear opinion on the state of things and doesn’t hesitate to make it obvious what he believes. That said, there aren’t many surprises in The New World. While it’s not exactly common to let people vote to kill suspects on live TV, this is hardly the first story to display the bloodthirsty habits of reality TV viewers, and the punchline of this first issue isn’t a shock, but it is executed well. In many ways the book is very in line with what Kot has worked on before, particularly as an extrapolation from some of the darker parts of Material and Generation Gone. The clarity of Kot’s vision and opinions runs the risk of being preachy, but The New World offers enough dark humor and the kindness of just a little normalcy to balance out the prophesying. There are jokes about the internet of things that land well, and the relationship between one of the main characters and her home’s AI, sarcastic and convinced her cat is trying to kill it, provide much needed breathing room between more cynical scenes. At $4.99 the issue seems expensive, but it’s more than 60 pages long and includes backmatter by up and coming creators that Kot wants to feature. The issue is packed to the gills with story and art even without this extra material, and well worth the cover price.